This past Christmas I received some new games for therapy. When I sent my Amazon wish list to my family, my brother thought I had sent the wrong list, as mine had games and an electric razor scooter. I didn’t get the electric razor scooter, but I did get some fun new games. Barbecue Party is one of the new games that I received. I love this game. Like so many of my games, I rarely play them with the included instructions. These are some ideas for implementing this game. Multisyllabic words – many of the items in this game are multisyllabic words. For example barbecue, vegetable, red peppers, broccoli, and tomato. With one of my students, we are working on simple repetitive sentences with multisyllabic words. So we practiced saying: “I eat…”, “I cook…”, etc. Following directions – this a great game to practice following one and two step directions. Auditory descriptions (distinctive features) – have the individual choose the item by description. For example, find the vegetable that is orange, but can be multiple colors or find the item that is a meat and has fins. descriptive words – color, class/group, and more. An added component to this game is the pop-up feature. When too many items are added, the grill pops up spilling many of the items. I am not sure who loves this feature more, me or my students! 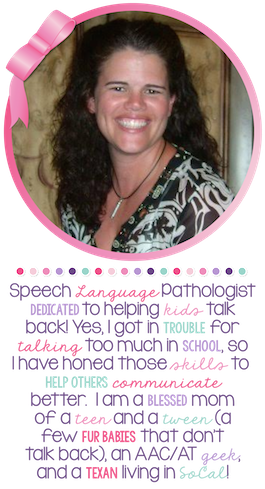 The above ideas are just a few of the various ways you can use this game in speech therapy. 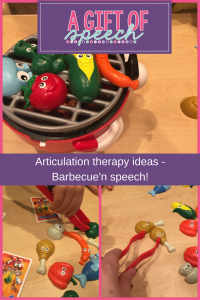 Whether you are working on articulation or following directions, have fun with your barbecue party. What are you doing for your next barbecue party?